The sun finally poked through the gray winter clouds last week in Northeast Ohio, melting the remaining snowdrifts and giving us a taste of the warm weather to come. St. Patrick’s day was brilliantly sunny and a balmy 65 degrees. These small signs of spring had me thinking about all the light, refreshing recipes that accompany the spring and summer months. Now, I don’t think rarebit is necessarily categorized under “light fare” but compared to beef and Guinness pie, I thought it seemed considerably less heavy. I used a recipe originally published in Gourmet magazine in October of 2008 with a few adjustments to give mine a little bit more of a mustardy tang. Melt butter in a small heavy saucepan over medium heat. 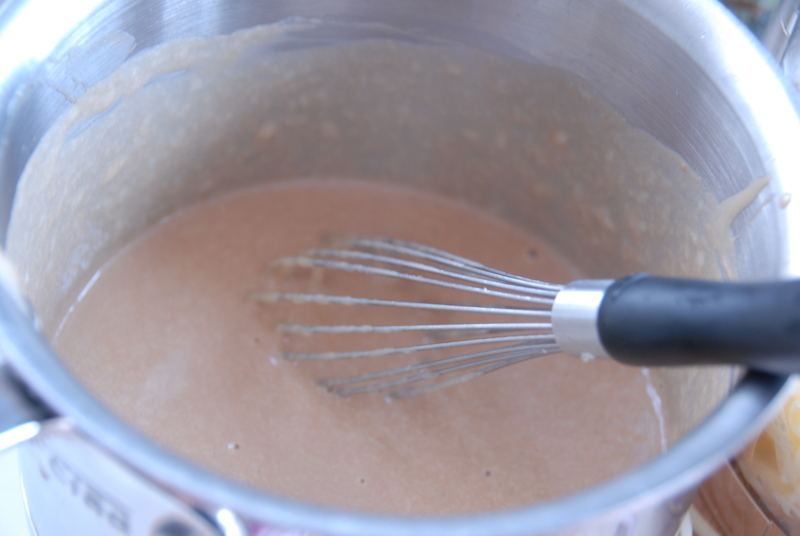 Whisk in flour and dry mustard and cook, whisking, 2 minutes. Add beer, water, brown sugar, mustard, and Worcestershire sauce and simmer, whisking, until just thickened. Remove from the heat and gradually whisk in the cheese until it’s smooth. Season with salt and pepper. Fry eggs and toast bread. Top each slice of toast with cheese sauce and a fried egg. 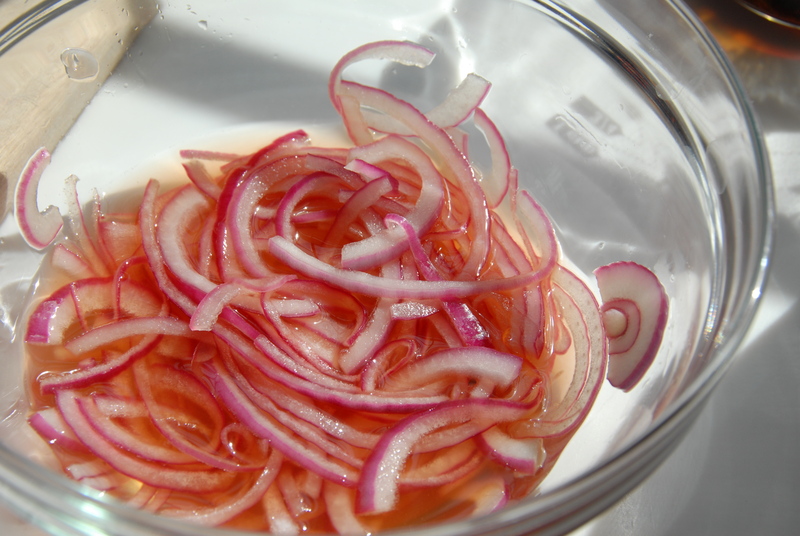 Toss watercress with oil, a pinch of salt, and drained pickled onions and arrange them on top. Dig in. 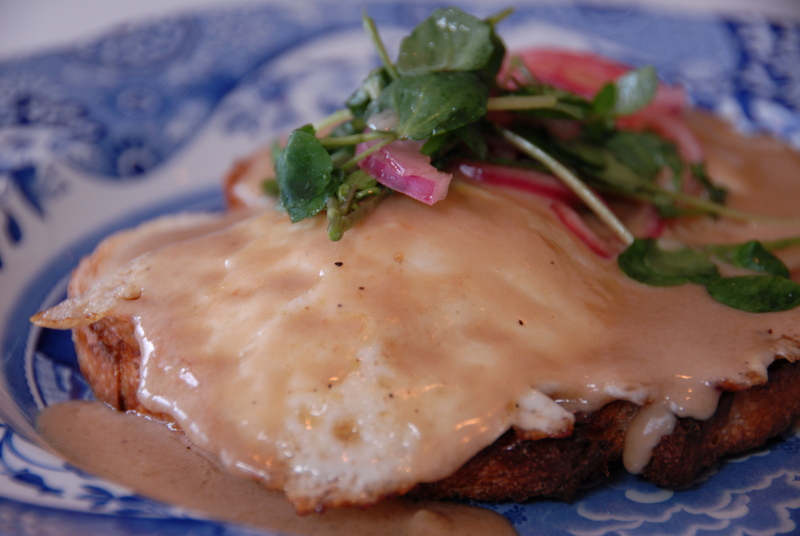 The zing of the pickled onions pair incredibly well with the velvety egg yolk and rarebit. I actually made this last Thursday for a midday treat and the sauce kept quite well through the weekend. I simply reheated it using a double broiler when I craved a little more! Oh, and this is best paired with an ice cold Guinness. Naturally. This entry was posted in Guinness and tagged cheddar, egg, Guinness, mustard, pickled onions, rarebit, sourdough, watercress. Bookmark the permalink.